I have just released my preset expansion Carmen for BYOME. Carmen is an ambiguous Latin word meaning chant, magical formular, incantation, poem. Following these terms, Carmen for Unfiltered Audio BYOME is a unique collection of patches comprising ambient soundscape-makers which will transform the incoming audio into fascinating and wondrous musical and sometimes alien textures. You will also find rhythmical gates, glitch-makers and filter-scapes, granular mayhem and complex delay lines, experimental craziness, deep spaces, stereo madness, complex drum processors and other effect combinations words fail to describe. All 102 presets are programmed 100% wet for inserting the plug-in on a bus, up to 8 Macros are assigned per patch for quick and easy interaction with the presets. While programming the presets for Carmen, numerous acoustic instruments, percussion, drums but also synthetic sounds were used as audio input in order to create patches which are useful in a musical context but also for sound design and post production. *102 patches, up to 8 Macros assigned per patch. *Programmed 100% wet for bus insert. All demos below were produced using only effects provided by the patches from Carmen. Processing two of my Icarus patches (wave-table/pluck&pad sound) with a preset from Carmen for BYOME which combines a phaser module with high feedback and tempo-synced/sequenced modulations, tempo-synced delays and warped reverb. Demo starts dry, some Macro automation for delay/reverb mix and phaser speed. Processing sampled acoustic guitar with a preset from Carmen for BYOME which combines vibrato, distortion, HP filter, flanger, delay and reverb. Tweaking the installed Macros on the fly. Processing a synth lead (Avenger, from my sound library Panopticon) with a patch from Carmen for BYOME - all effects in Avenger are turned off. Some Macro automation in LogicX. Dynamic cello sustains (VSL Solo Strings XT) processed with a preset from the expansion Carmen for BYOME, Macro automation in LogicX. Demo starts dry. Glass harp sequence played with mallets, processed using a patch from Carmen for BYOME, descriptions embedded in the video. 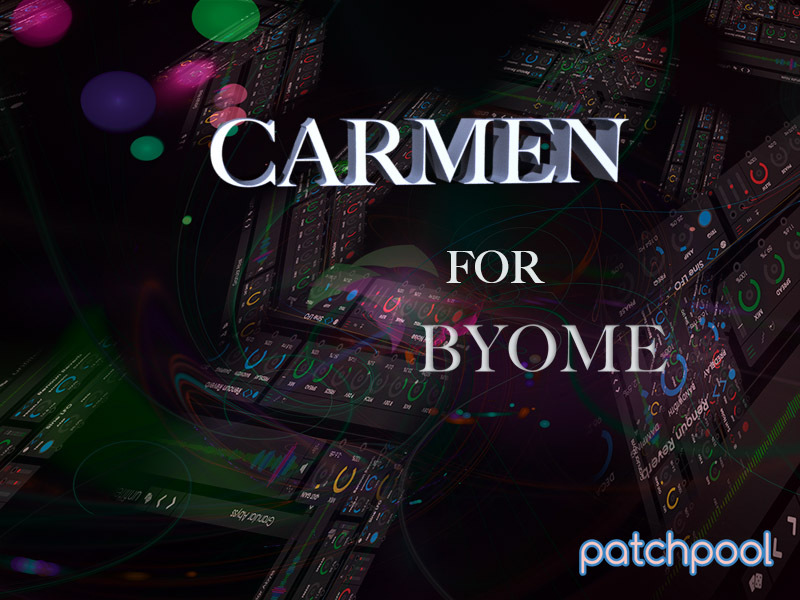 I just sent out the first 35 patches from Carmen for BYOME, please check your inboxes (and spam folders). Some of these patches may change later concerning the Macro assignment and fine-tuning and there is no documentation yet. BYOME rocks! A simple Rhodes (Lounge Lizard) theme processed with a patch from Carmen for BYOME - demo starts dry. Processing a granulated glass harp arpeggio with a patch from Carmen for BYOME - some Macro automation for BYOME (flanger/delay/reverb mix) and some Macro automation for the glass harp (grain density, grain speed) - demo starts dry. Processing a little piano improvisation with a patch from Carmen for BYOME, some Macro automation in BYOME for the “color“ of the space. Demo starts dry. I'm now onboard with Byome, this looks like the modular effects system to really get to terms with effects chains in a very easy to use interface. Thanks for making presets for it Simon. I'm listening to the demos now. Super High Quality sound at first listening so that's a definite plus. waves break, but somehow it all makes sense. BYOME still has some things to be ironed out (especially in the granular engine) and adding routing options like in MXXX would be a great plus, but already in it's current state it's a powerful tool and definitely a keeper. Ja the routing is not developed but I suppose there's always something that needs improving. I can setup a few tricks in Numerology Pro that might give me some work arounds for the routing issue. Main draw for me after the sound quality and your coming librarie(s) for it is it's intuitive to use. Processing a layered synth pad (Falcon+MFS) with a patch from Carmen for BYOME - tweaking the installed Macros on the fly, demo starts dry.